A motoring maniac lost control at 80mph on a bad road and overturned his vehicle to leave himself and his passengers trapped inside. Edmund Reid (23) was said to be “showing off” while he was driving his car on the quiet road where he had narrowly avoided a collision a week earlier. It was fortunate he and his passengers suffered only minor injuries and there were no other vehicles on the road when he lost control and flipped his car. 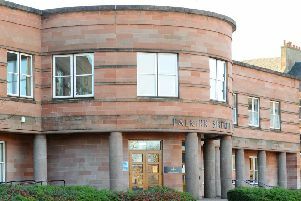 Reid, 65 Abbotsford Street, Bainsford, appeared at Falkirk Sheriff Court last Thursday having pled previously guilty to dangerous driving on Moss Road, Airth, on May 5. Procurator fiscal depute Laura Knox said: “It was 1.20pm and the passengers observed the accused had increased the speed of the vehicle to 80mph in a 60mph area. The accused failed to react to a warning sign of an uneven road surface around half-a-mile away. “He then attempted to negotiate a sweeping right hand bend and lost control of the vehicle, which swerved across both carriageways and left the road, coming to a stop on the near side carriageway having overturned 360 degrees. Reid was banned from driving for 20 months and fined £1000 which he was told to pay back at a rate of £350 per month.